Our vintage chair got a quick makeover with new cushions; what do you think? Love it! That is one of my favorite fabrics!! It looks great!! That chair had good lines to start with, but that fabric is a true improvement. Way to go! I love the new fabric! 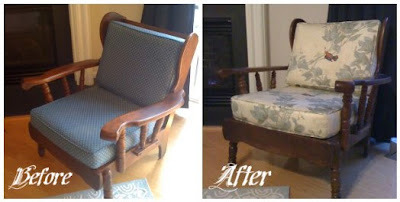 I think updating and refurbishing old furniture adds a special touch to the home! Great job. That is a gorgeous makeover!